Ooooh, ooooh, newsy and exciting! The lease isn’t signed yet so I don’t want to divulge specific details, but it’s pretty safe to say that by the end of this month the wee space shown here will have been vacated and replaced with a Tiddleywink Vintage shoppette. The online stores will both remain open, this is merely an expansion to cater to local customers who want to see things in person, as well as give me a place to sell items which are too fragile or heavy to ship for a reasonable price. ::coughRACCOONCOATcough:: As a bonus to me, it will get a selection of inventory out of my house! The space is a mere 8′ wide by 2′ deep, but it has better foot traffic than a larger space I looked at today. I won’t have room for more than a clothing rack (approx. 52″ wide) and something like a bookshelf next to it to fill with Pyrex and other non-hanging items. There are so many pegboard accessories on the market right now, I could definitely utilize the space in an assortment of ways. I’m open to suggestion! What do you think? I’m trying out the Gallery feature for this post, so you’ll have to click each image to see the complete (and large!) view. Please let me know in the comments below if you like, hate, or are indifferent about seeing the photos this way. Thanks! 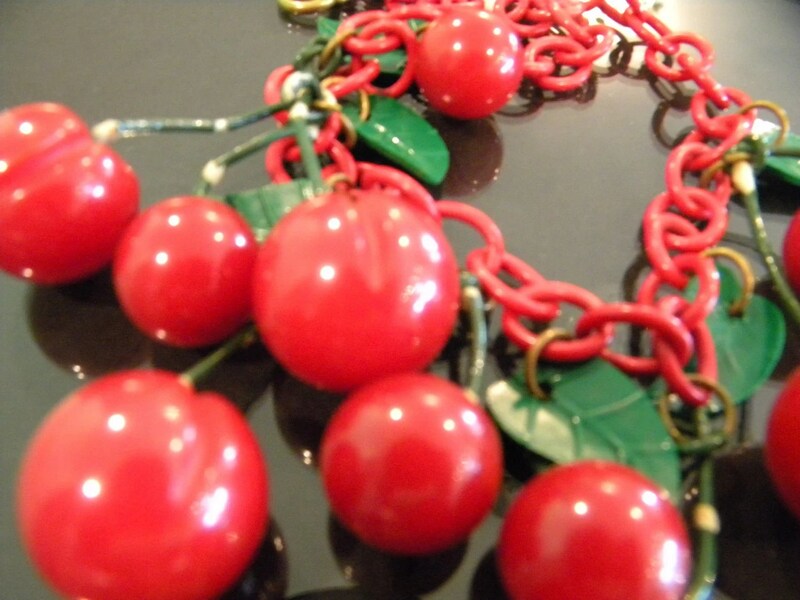 Necklace with 8 Bakelite cherries on red celluloid chain and 5 green celluloid leaves. Extensive wear to plastic coating of cherry stems and cracks and wear to red jump rings attaching cherries to chain. 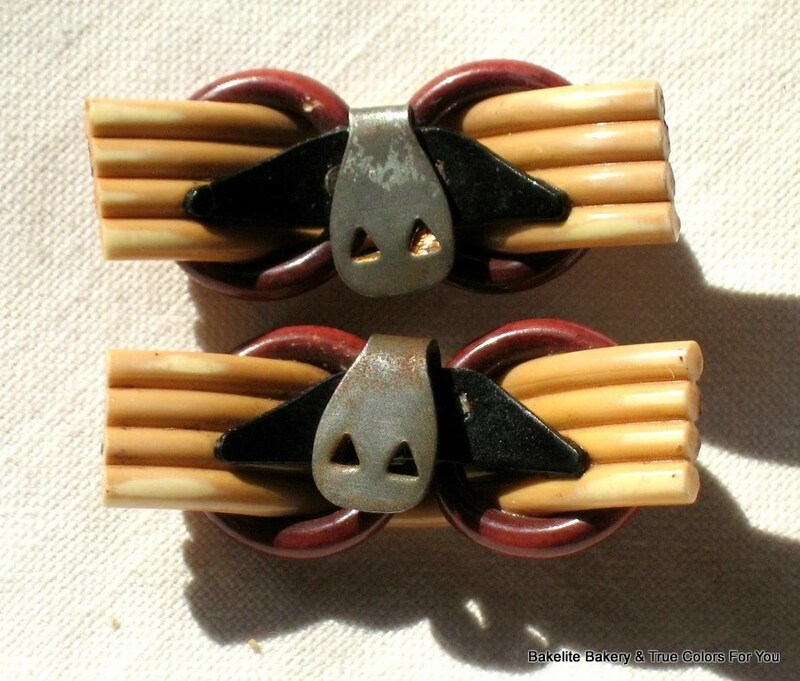 Bakelite bow pin with 7 marbled Bakelite cherries. Wear to plastic coating on stems. Glue residue around stem hole on back of bow. Realized auction price of $575 in 2004. Bakelite |ËˆbÄk(É™)ËŒlÄ«t|Â noun trademark -Â an early form of brittle plastic, made from formaldehyde and phenol.Â Designated aÂ National Historic Chemical LandmarkÂ by theÂ American Chemical SocietyÂ in recognition of its significance as the world’s first synthetic plastic. ORIGIN early 20th cent. : named after Leo H. Baekeland (1863â€“1944), the Belgian-born American chemist who invented it, + -ite. One of the firstÂ plasticsÂ made from synthetic components, Bakelite was usedÂ in electricalÂ insulators, radio casings, kitchenware,Â jewelry, and children’sÂ toys. 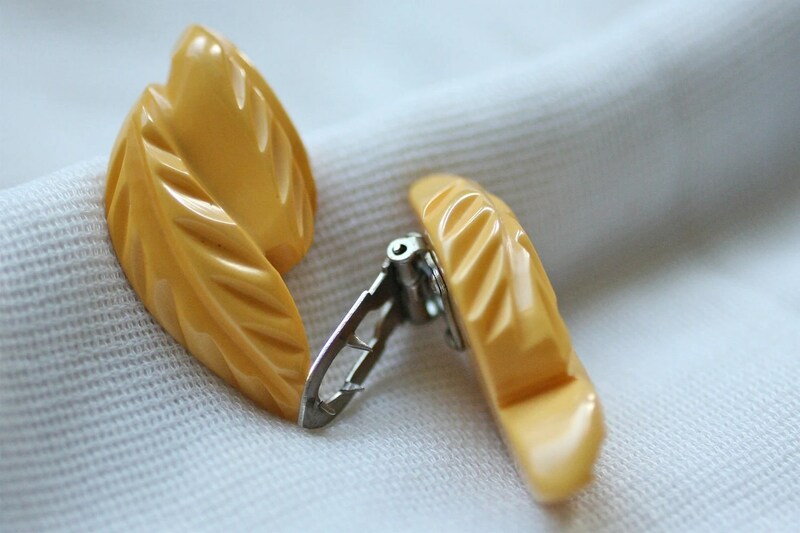 One of the more collectible lines of Bakelite jewelry is a collection that may or may not have been called Cherries Jubilee, originally produced in the 1940s. (I can’t find documentation to support the nomenclature, but I’m not a professional researcher.) If you search online for the necklace in this line, you’ll find many examples in a wide price range, from original sets to reproductions. While some are worth every penny and some bear an inflated “market value,” they’re all out of my pathetic little price range. So, it looks like it’s time once again to Get Crafty! I’d had the vague mental plan to recreate my own version of this necklace for a Very Long Time. It wasn’t until I was looking for a bit of chain in order to carry out a clever earring storage trick I’d seen on Pinterest that I realized I could accomplish both projects with one purchase. So, while I was at it, I picked up some plastic beads, a packet of head pins, and some filagree bead caps. Parts Left Over: many bits, I’ll make matching earrings at the very least. This was going to be more of a tutorial, but here’s the thing: if you actually give enough of a whit about making jewelry to have the proper tool for making loops on head pins, then you can already figure out how to put this together. If, however, you love it so much that you need to run out and buy round-nose micro pliers just to make this necklace, comment below and I’ll break down all of the steps for you. Now, my version contains more metal parts than the original (head pin “stems,” bead caps, chain) and the plastic bits don’t even pretend to look like Bakelite, but I was going for the general effect, not a precise reproduction. If I wanted a “real deal” look, I’d buy the hand-made version (and matching pin while I’m at it) from Melody O’Beau because she deserves to get paid for all of the work and care she puts into hers. And fini! My version will work just fine, for now. BURGUNDY BLACK AND GREEN FRENCH BAKELITE NECKLACE WITH DANGLING CHERRY FRUITS. CARVED DETAILS ON FRUITS AND LEAVES. Okay, so it’s not so much of a tale, actually. Unless you’ve “heard strange tales about mysterious looking Hands.” I came across this small ad in the margin of one of my old magazines (this one from 1959) and I’m intrigued by thisâ€¦thing. The cost of $3.48 wasn’t exactly small change back then: according to my handy inflation calculator, that’s the buying power of a little more than $27 today. But hey, it does come in its own lambskin bag! I’m just as curious about the semi-random capitalization throughout the ad as I am about the curio. The only other mention I can find online of the P. S. Bureau Co. (not the U.K. utility company) is another ad, this time for a Perpetual Prayer Cross. I can’t tell you much about this curious curio, but if I ever run across one, I’m gluing a pinback to it and wearing it as a “strange” brooch! One of these things is not like the others, one of these things just doesn’t belong. Can you tell which thing is not like the others, by the time I finish my song? Dress clips are not shoe clips are not clip-on earrings. They are not interchangeable. 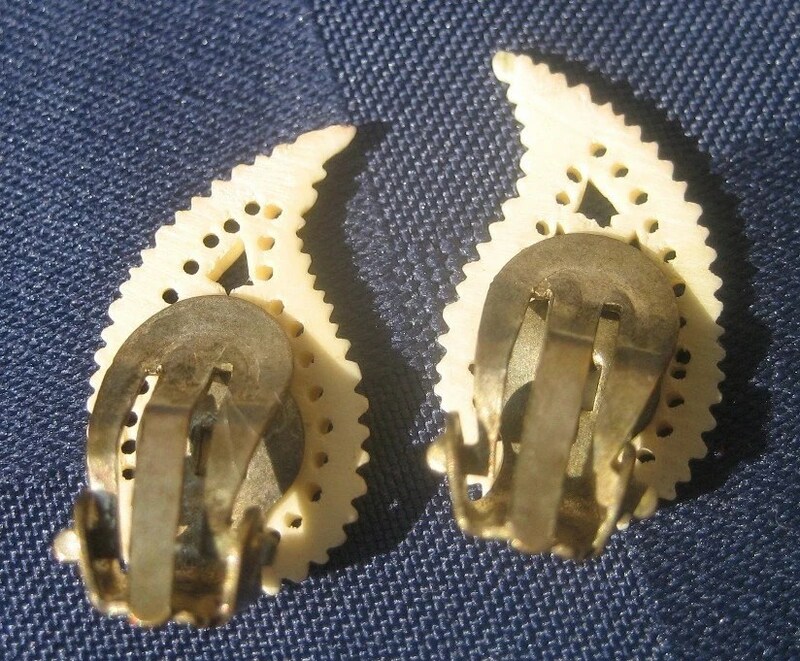 I have personally attempted to use clip-on earrings as shoe clips, and they hurt because they’re too dimensional. I wouldn’t dare use dress clips on my ears, because that’s akin to clipping an iron maiden onto your earlobes. Neither shoe clips nor earrings have the strength required to gather and restrain fabric like dress clips. Grandma, what big teeth you have! See how the clip lies flat and smooth, and isn’t hinged? A hinge would dig right into the top of your foot. All. Day. Long. Note the tensioned hinge and the somewhat curved (cushioned, as much as metal will) piece that presses against the earlobe. No teeth here! This is not to say that there are never variations on the hardware for these items, but before you buy (or sell), think about the purpose these items are being advertised for, and whether or not the hardware is up to the task. DISCLOSURE: As you know if you’re a regular reader, I am a vendor with twoÂ vintage-themedÂ shopsÂ on Etsy. MagpieSue (earrings) and I are both members of theÂ Vintage LoversÂ andÂ Vintage MarketÂ teams on Etsy; I otherwise have no affiliation with these particular vendors. Hi, I’m Troy McClure and you may remember me from such educational films asâ€¦ no, wait, that’s not right. But I am Tiddleywink (Design, Vintage) and Winkorama Vintage Sewing. Happy to fulfill your vintage clothing, vintage sewing, and freelance print production dreams. Not necessarily in that order. As of today, I’m also Tiddleywink Retro. It’s not really a big deal, just a little shop for the misfits: the items of clothing, etc. which don’t qualify for my Etsy shop because they’re not truly vintage, but are too nice and/or expensive to simply toss in the donation pile. Trust me, there’s plenty in the donation pile already. These are things that I either bought for myself but never wore, or bought as vintage for the shop only to find upon close inspection that they’re not as “vintage” as may have been advertised. And so here is where those items will be posted, hoping for new homes. The listing prices will be set at whatever I paid for each item; no more, no less. No markup. No profit. No sales. No discounts. Tiddleywink Retro. It looks an awful lot like this. So stroll around, take a look, tell your friends. Buy stuff that deserves to be worn, rather than hanging in a dark closet with no foreseeable future. Swell, innit? Click to visit. Yeah, I know. My hands aren’t stupid. But they are, in relation to the rest of my adult-size body, tiny. Which really shouldn’t play into this discussion at all, because tiny or no, my rings fit MY hands. I wear two rings every day, both on the ring finger (logical, eh?) of my right hand. One is a garnet cabochon set in sterling silver, and was a gift from my aunt when I was 9. Yes, it still fits. Tiny hands, remember? The other is a plain, silver band that found its way to me by chance and fate. That is to say, I found it in the laundry room of the condo complex where I lived many years ago, and it (rather surprisingly) fit. I posted a flier for a couple of weeks, hoping to find the proper owner, but nobody came forward. And so, it was mine. It disappeared once before, when a then-boyfriend had taken it in order to have a new ring made for me to the proper size. I knew he had it, I had lent it to him in the first place (I didn’t know what his plan was, he’d made up a plausible story for wanting it) and so there was no concern. This morning, though. This morning I was taking a photo of my new, reverse-carved Lucite bangle bracelet (which is technically a watch although the battery is dead and I haven’t worn a watch in years anyway) and I looked at my hand in the photo and it looked funny. Peculiar. Why does it WHERE IS MY SILVER RING? I unmade the bed, hoping it had slipped off under a pillow during the night. * No such luck. I checked the bathroom counter, my purse, my jacket pockets. After doing chores like laundry and reorganizing my pantry (read: throwing away heinously outdated stuff), I was out and about “on the town” yesterday (ModMood, ARC, The Wrecking Ball), so it could have fallen off at any number of places. Did the ring cost me any money? No. Was it sentimental? Other than I’ve had it for a long time, no. Is it irreplaceable? No, a quick search shows that I can find a new one online although for some inexplicable reason they’re less expensive in the (more common) larger sizes. But this one was mine. And I lost it. And, if you read this blog with any regularity, you know that I hate losing things. *I sleep in my rings, I shower in my rings, I wash dishes in my rings… I don’t take them off, except when I’m applying pomade or moisturizer and I don’t want them getting gunky. UPDATE: It’s now however many hours (8ishy) after I originally wrote this post, and HOLY CRAP I JUST FOUND MY RING!!! Right smack dab in the middle of my “office” floor. As in, about 4 feet DIRECTLY BEHIND THE VERY CHAIR I’M SITTING IN. And which I’ve had to walk OVER about 8 times today. Wotthehell? Best guess is that it WAS elsewhere, and one of the kittehs was playing with it until it landed here. Whatever. MY RING! Glee!